Restrictions- no camping, DNR fee site, requires $6 daily fee or $24 annual pass, no fishing in close proximity to buoys labled "research"
Fishing- Known for panfish, Northern Pike, Largemouth and Smallmouth Bass, Walleye Pike, Muskellung, Salmon in the fall, Steelhead in the fall and spring. Fish from Manistee Lake may contain high levels of mercury and heavy metals. 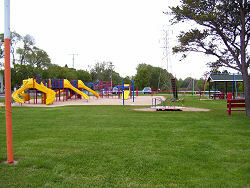 Stronach Township Park has one of the nicest playgrounds in the area. There is a large modular play unit with various climbers and slides. This unit, and a merry-go-round are on sand. In the grassy area are swings, toddler swings, two sizes of slides and spring riding animals. There is a baseball diamond, volleyball court (grass), and soccer field. Ecosystem- small town at edge of Manistee Lake which is a deep water port, with industrial use. The park is close to the water, but high above it. From US 31, turn east just south of Manistee on Filer City Road. This descends a hill to a T across from the Packaging Corporation of America. Take a right, wind around the end of the lake and you will soon enter the village of Stronach. The park is easily visible on the left. 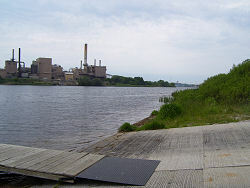 To reach the boat launch, continue past the park to 2nd Street. Turn left, and veer right at the end of the street into the access parking area. Or, from US 31, turn east on Preuss Road which is marked with a brown public access sign. When you reach a T, turn left. The road jogs right, and then make a left on Huer Hill Road. This reaches a T on Filer City Road. Turn right and enter Stronach as above. This way seems more complicated to me than the option above, but it is the route that is officially marked. From MI-55 turn southwest on Stronach Road. This angles into the village of Stronach. When you reach a T the park is directly across from you. Turn right to reach the boat launch, then left on 2nd Street. Veer right at the end of the street into the access parking area.